What a few months this has been! It's not just a question of the number of activities, but it is also the range of activities that shows what kind of a dedicated organization the Friends continues to be. Just consider this: Since our last newsletter we have sold thousands of books in two very public places. 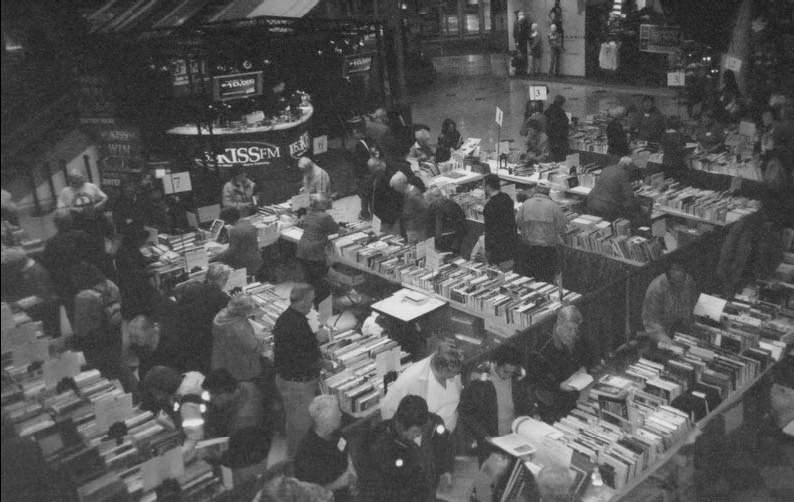 The 2005 Book Sale, this time at St-Laurent Centre, was a chance for us to go "back to the future." 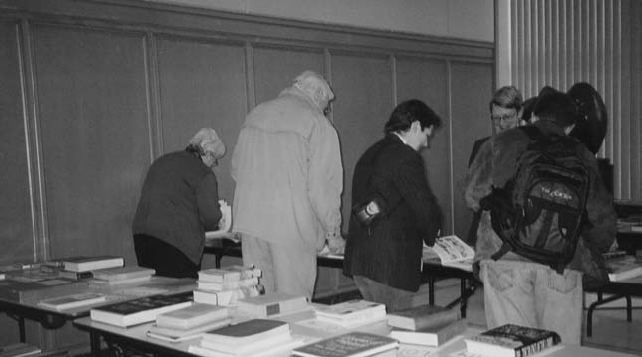 St-Laurent was the venue for the first ever Friends' book sale, in 1995, back when the Library and Archives Canada operated as two separate institutions, each with its own group of Friends. This venture is a major activity requiring literally thousands of hours of volunteer time and toil. Shortly after the 2005 event, we sold additional books at a special one-day sale at 395 Wellington. And lest we are thought of only as merchants and traders of used goods, the Friends also took part in supporting a superb presentation on Josephus, offered under the auspices of the Lowy Council. This was a wonderful lecture given to a wide ranging and fully captivated audience. Yet again, the energy and enthusiasm of the Lowy Council is a source of inspiration to us all. Finally, besides sorting, counting, transporting and selling books; besides organizing, catering, and moderating a public programme; our Board also took time off for an important planning day. We spent a day at Strathmere, not ambling through the grounds in the early fall sunlight, but considering the kind of Friends group we might become in the years ahead. The result is a renewed focus on linking all our energies to the collection, to public programming, and to reaching more and more like-minded Canadians. The goal is simple. It is to encourage as many not-yet-friends to come and join us in our support of this wonderful institution and its incomparable collection: Library and Archives Canada. May 2006 be yet another great year for Friendship! The start of a new year is a good opportunity to reflect on the months that went before and to look ahead at what the future holds for Library and Archives Canada, and for the Friends. As we move forward into 2006, we do so as a brand new organization, an integrated knowledge institution that combines the roles of a national library, a national archives, and a national portrait museum. While I am very excited about 2006, I am also extremely proud of our achievements in 2005, the culmination of three years of work to determine what our institution would be, to define its framework, its long-term vision, its systems and ways of working, its very organization. We are now ready to move to the implementing stage and to put all of this into practice to serve Canadians in new ways and to meet the complex challenges of the digital age. We cannot do this without your help. As our role has changed, so has the role of the Friends, who now become an even more important element of our commitment to serving and reaching out to Canadians. We have launched many of the tools we need to fulfil our mandate, such as service improvements that make it easier to access and use LAC resources and integrated reference and consultation areas to streamline research. However, what I envision for the Friends is not a system or a service, but a new relationship between the Friends and LAC. What I see is a partnership based on discussion and dialogue, working closely together as we enter a new phase of a transformed institution. The transformation of LAC has now completed the phase that goes on quietly behind the scenes and moved on to the next stage - enabling us to accomplish what we set out to. The new year signals our commitment to reinforcing the links between LAC and the Friends of LAC, realigning our former mandate and priorities with those of the Friends and seeing our clients and their needs with new eyes. I welcome your support, your advice and your continued, transformed involvement. As partners, I look forward to working collectively to promote and to communicate the exciting events planned for 2006, from the Canadian Digital Information Symposium in March, which will gather leading experts in the field to develop a national strategy on this exciting new area for Canada, to the launch of the TD Summer Reading Club to promote literacy and a love of reading among school-age children. As partners, I hope that together we will have a greater exchange of information and ideas on programs and exhibitions, and to cultivate the input of the Friends, the volunteers who make their unique mark on the development of our national heritage by contributing time and effort to our renewed institution. Together, we have shaped an institution that boldly goes where no such institution has gone before - making a real difference in the lives of Canadians, challenging our traditional notions of libraries, archives, and museums, harnessing the infinite possibilities of our digital environment, and leading the world in the ways we manage and deal with vast quantities of information. The implications of our new age are profound, and I look forward to heading into this fascinating new frontier together. When the financial report was completed, $6879.31 was the net profit realized for the coffers of the Friends. Pre-auction viewing of some of the lots. The sixth Antiquarian Book Auction was held on the night of Friday, April 8, last year. The Bytown Auctioneers, Joe and Jill Westra, offered 152 lots on our behalf and at the end of the evening, several thousand dollars had been raised for Library and Archives Canada. The catalogue reflected a wide variety of genres, as usual. Among the titles which attracted the most interest were nineteenthcentury travel books and three, slim volumes, the work of James Guthrie, published by the Old Bourne Press in 1903. These were: The Elf: A Sequence of the Seasons [Autumn, Summer and Spring], which sold for $270.00 each. As well, a book published by The Roycrofters in 1907 drew a successful bid of $100.00, as did Ezra Pound's The Pisan Cantos. Another volume, Ruari McLean's Modern Book Design: From William Morris to the Present Day, realized $230.00. When the financial report was completed, $6,879.31 was the net profit realized for the coffers of the Friends. After six years we have come to recognize familiar faces at our auctions. Many of those who attend come not only for their love of books, but also to support a worthy cause. We appreciate their loyalty. We continue to depend on the generosity of the public. This year a significant donation came from the estate of the Hon. 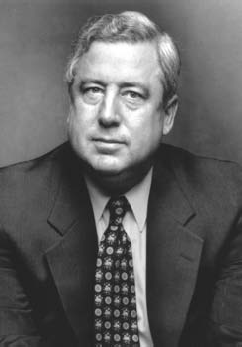 Mitchell Sharp. Some of these books, many signed and inscribed, will be featured in our spring auction, which will be held on May 5. Joe Westra, Bytown Auctioneers, who donates his services to the Friends is assisted by his wife, Jill. 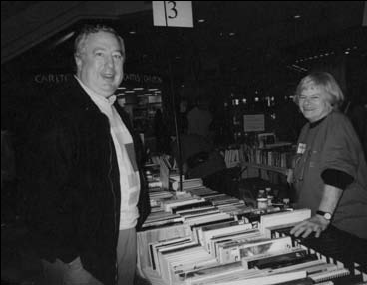 The Friends' annual book sale was held at the St. Laurent Centre, on the weekend of October 14 - 16, 2005. This was a new venue, after several years at the Carlingwood Shopping Centre. Nevertheless, there was, as usual, an immense variety of books on every imaginable subject in both English and French - literature, history, biography, science, language, religion, mystery and science fiction, to mention just a few, as well as some musical items (LPs, CDs, cassettes) which were very popular. Regular customers as well as casual passers-by enjoyed browsing through the assorted volumes on the long tables. Many of the Friends who volunteer annually to help at the sale enjoyed the new location. The presence of KISS-FM radio station, which was broadcasting from St. Laurent during the sale, enlivened the scene. Regular announcements about the sale gave it lots of publicity and a couple of our volunteers were interviewed on air. Total revenues from the sale were $23,404. The 2006 book sale will take place again at St. Laurent Centre, from Friday, September 29 to Sunday, October 1. Mark these dates on your calendar now. 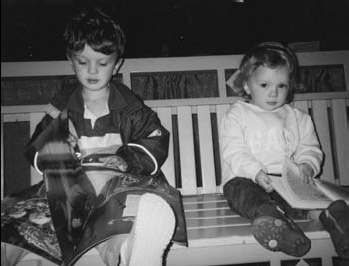 Above Left: Two very young readers enjoy their treasures. 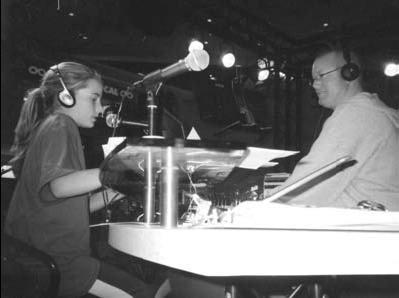 Above Right: One of our youngest volunteers, Chelsea Ellis, reads the weather on radio station KISS FM. Above Left: Ian Wilson, Librarian and Archivist of Canada, and Marianne Scott, former National Librarian share a joke. 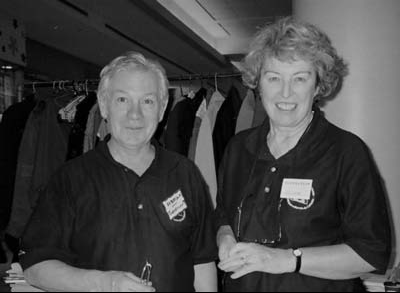 Above Right: Elizabeth Mundell, Chair of the Book Sale Committee and Bob Lamoureux, volunteer extraordinaire (we couldn't have the sale without him!) pause for a moment to rest and admire their work. Bob Lamoureux hard at work in the sorting area at Tunney's Pasture. Since the first Book Sale in 1995 close to 600,000 donated books have been received, sorted and packed. 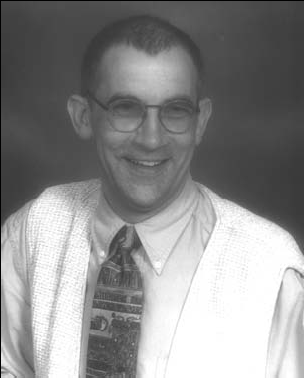 November and December are perennially culturally active months at Library and Archives Canada, and the year 2005 was extraordinarily so for the Jacob M. Lowy Collection. 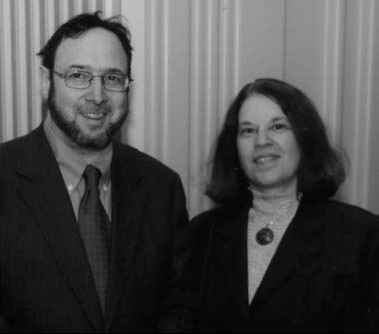 The Council of the Jacob M. Lowy Collection sponsored two very successful lectures. In November, York University's Prof. Steve Mason presented The Judean Josephus in the Christian West. 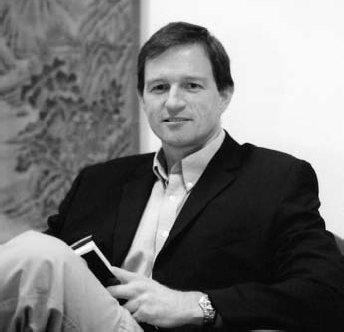 Through a masterful examination of the use made of one passage in Josephus' Judean War, Prof. Mason surveyed how Christian authors from antiquity through early modernity appropriated Josephus' writings to further their own projects, and in so doing, shaped Christian perception of Jews and Judaism throughout history. Prof. Mason not only enabled his audience to understand the enduring importance of antiquity, but he also brought into relief the elusive, historical Josephus of 1st century Judea and Rome. A selection of early printed editions of Josephus' works drawn from the Jacob M. Lowy Collection of rare Hebraica and Judaica filled two display cases. 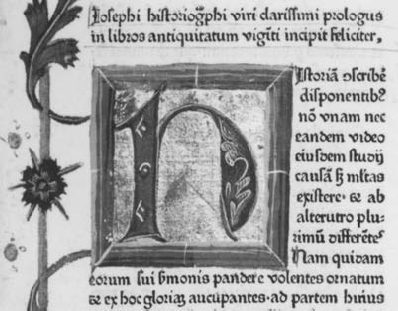 Among them was the first printing ever (editio princeps) of any of Josephus' works, and oldest book in Library and Archives Canada, the illuminated, Latin Josephus of 1470. Also among the displayed books were the editio princeps of the Greek text - the language in which Josephus wrote - from 1544, and a Dutch edition of 1732, with monumental, detailed engravings. The Lowy Council's cultural year had actually begun earlier, in April 2005, with a lecture by Brad Sabin Hill, curator of the Lowy Collection between the years 1979-1989. Mr. Hill shared his vast knowledge through the illustrated lecture The Art of Hebrew Printing, guiding the audience through the centuries following the introduction of Hebrew printing in 1470, and exploring the art and aesthetic of the Hebrew book - its papers, types, ornamentation and design. His was a scholarly, intense and sometimes humourous survey of this complex world. On the evenings of Monday, December 5th and Thursday, December 8th, 2005, the Embassies of France, Israel and Spain, in conjunction with the Canada-Israel Cultural Foundation and Library and Archives Canada presented Words of Wisdom: Rashi and Maimonides, Lights of the Middle Ages, a series of lectures accompanied by a display of rare first and early editions from the Jacob M. Lowy Collection. The series was conceived to honour the 900th and 800th anniversaries of the deaths of Rashi and Maimonides respectively. Rashi (Rabbi Shelomo Yitshaki of France) and Maimonides (Rabbi Mosheh ben Maimon, or Rambam, of Spain and Egypt) are the two most illustrious Jewish scholars of the 11th and 12th centuries; their writings remain fundamental to the study of Torah and Talmud today. Beyond the realm of religion, Rashi is also known as a linguist whose translations of Hebrew words into Old French are among the earliest extant glosses in that language, while Maimonides is universally known for his writings on medicine and philosophy. Among the books displayed in the four cases were Talmud tractate Eruvin from 1515 and a Pentateuch manuscript copied in Yemen in the 19th century which featured the commentaries of Rashi; a volume of the law code Mishneh Torah printed in Rome, circa 1475, one of the earliest printed Hebrew books; and a 1553 edition of Guide for the Perplexed, both by Maimonides. Lecturers in the series were Dr. Claude Sultan of the Rashi Institute in Troyes, France; Dr. Ira Robinson of Concordia University, Montréal; Dr. Robert Seltzer of Hunter College, New York; and Dr. Ángel S·enz- Badillos of Universidad Complutense, Madrid. Every five years Statistics Canada conducts a national Census of Population. The next Census Day is Tuesday, May 16, 2006. The National Census is an unparalleled source of information about Canada and its population. Information about seniors, immigrants, ethnic groups and workers that might otherwise be lost is captured and stored through census data. Also, because the census is conducted every five years using consistent lines of questions, it is possible to compare even subtle changes that have occurred in the demographics of Canada's population over time. Those of you who have done historical research or who have read history know the value of census records. Important studies in the field of social history by Canadian scholars such as Chad Gaffield, Bettina Bradbury, Bruce Elliott and Ruth Sandwell have relied heavily on raw data found in census records. These historians have collectively shaped our national memory by shedding light on the history of the Canadian family, immigration and rural life. Without census records, and the valuable information they contain, these and other social historians would lack the resources necessary to weave the tapestry of Canada's rich and textured past. Census data are transferred to Library and Archives Canada and made publicly available 92 years after they are recorded. This year, for the first time, Canadians will have the opportunity to choose if they wish to have their census information shared with future Canadians in this way. Information gathered in 2006 will be transferred from Statistics Canada to Library and Archives Canada in 2098, for those who gave their permission. These records will provide a wealth of information for future historians and those with an interest in the history and development of Canada. I am inviting you to count yourself in on Census Day this year and to be sure to indicate your agreement to help ensure that your role in Canada's history is recognized now and well into the future. You, too, can take an active role in the promotion of Census Day 2006 by encouraging your friends to also take their place in history. Together, we can help ensure a strong and vital Canadian historical record that will benefit future generations.